Baking cookies to help fight kids’ cancer might be the most worthy cause I’ve ever baked for. Have you ever heard of Cookies for Kids’ Cancer? If you haven’t, you should check out the link and read more about it. It’s a very worthy cause: bake sales to help find a cure for kids’ cancer. Earlier this year I did a story about a local bake sale event hosted by Heather Wirtz, the editor of the Macaroni Kids newsletter for the Cranston/Kent area. The sale raised money for the Cookies for Kids’ Cancer non-profit organization and it was hugely successful. I baked one of my favorite Christmas Cookie recipes, Brown Eyed Susans, for the bake sale. At the event itself I was given several handouts to help me in writing my article and I met one of the family members, Bonnie Soper, who told me how her cousin Gretchen lost her son to childhood cancer several years ago. Gretchen and her husband founded Cookies for Kids Cancer as a way to fight back, and they started with a simple bake sale. Other than the baking time, which was cut off, the full recipe was there, and I decided that I wanted to try out the recipe some day, in honor of Cookies for Kids’ Cancer. I wrote the news story about Heather’s bake sale in January and it was almost June before I had the chance to try out the cookie recipe. They were delicious and with every bite I thought of this important cause, and I knew I had to write about it. I’m so grateful and thankful every day that my family has its health. Those who know me well, know my kids are sick constantly, weekly, and it’s exhausting keeping up with it all. But they’re not terminally ill, and I keep that in mind daily as well as every week when I’m running someone to a doctor for one ailment or other. We are very, very lucky. In the big picture, they are healthy. 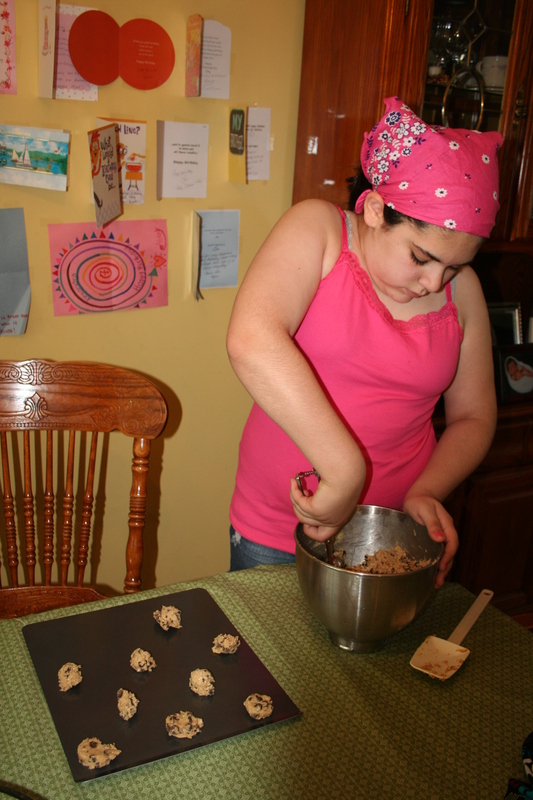 Caroline was a big help with these cookies, scooping and pressing the batter for each and every one. Speaking of my kids, my daughter Caroline was a big help to me this past weekend as I made these cookies to take with us to a Memorial Day cookout. The recipe yields quite a few cookies and that’s one reason I made it. There were enough to bring and enough to leave some home as well. I made all the batter and she scooped it onto the tray and flattened them to go into the oven. The recipe, as I said above, did not have the bake time on the card, which was an advertisement for the cookbook. But, I looked up a similar recipe in one of my cookbooks here and found that 10-12 minutes on a cookie sheet was the perfect time. The only time I went over that time was when I used a baking stone. I find that those take longer for cookies to bake than the metal trays. I hope you’ll consider doing a Cookies for Kids’ Cancer bake sale for your organization’s next fundraiser, or that the next time you’re looking for a unique gift, you go to their site and order some Cookies for Kids’ Cancer cookies to be sent to that special someone. 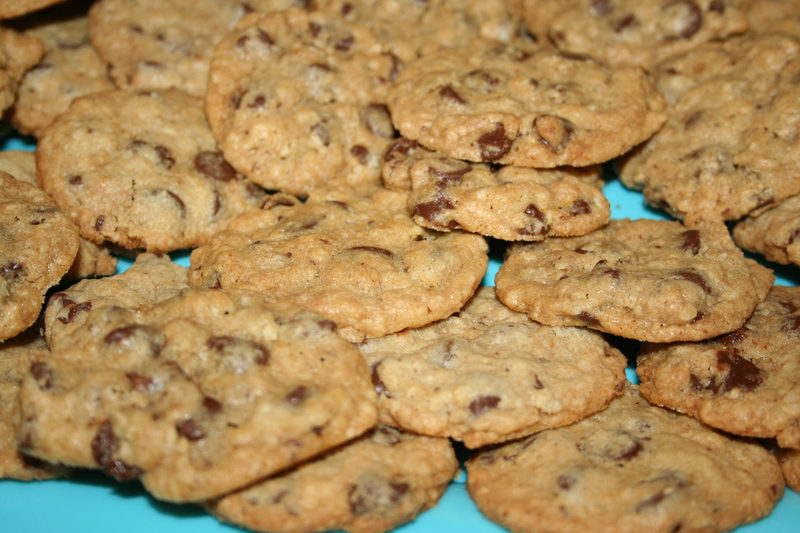 And now, here is the recipe, the Chocolate Chip Oatmeal Cookie that started it all. This recipe makes a lot of batter so you need a good, strong mixer to mix it up. 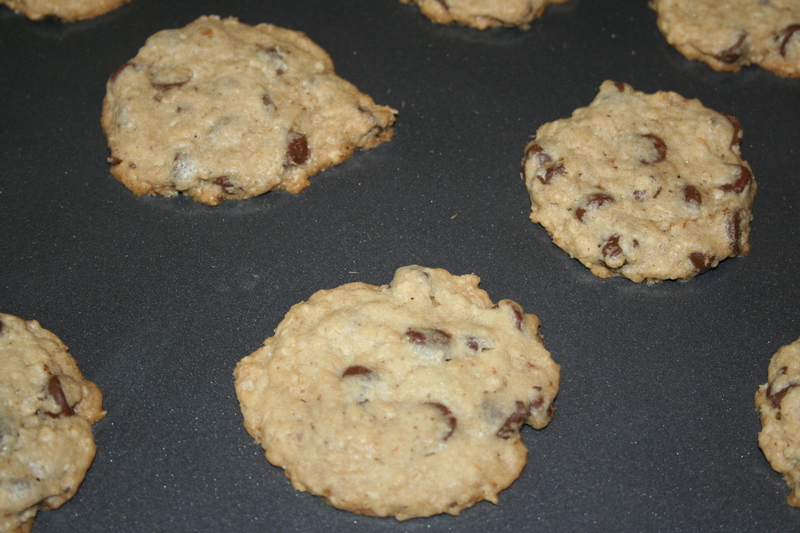 Cookies bake until lightly browned around the edges. 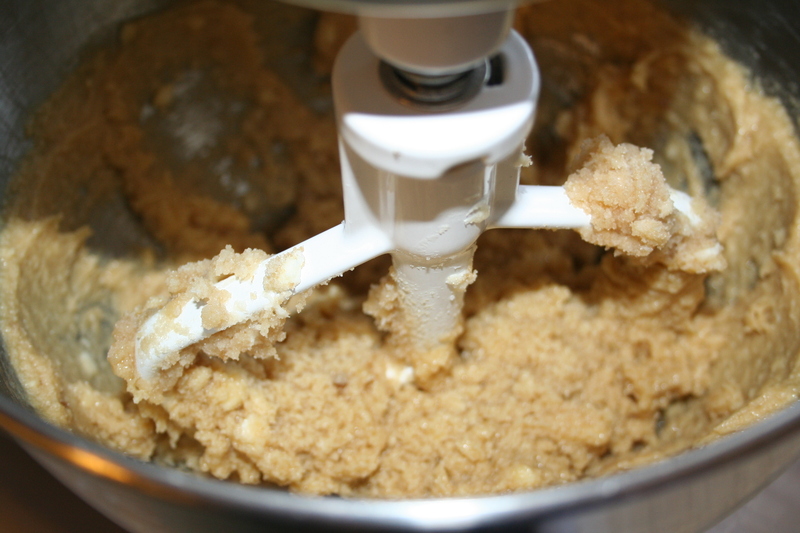 Place butter and sugars in the bowl of a mixer fitted with a paddle and beat until smooth and creamy. Add egg, egg yolk, and vanilla, one at a time, beating well between additions. Place the flour, oats, baking powder, baking soda and salt in a separate bowl; mix well and add to the butter mixture. Beat until everything is well incorporated. Scrape down the sides of the bowl, add the chocolate chips and beat again. Form the dough into heaping teaspoon sized-balls and place them about two inches apart on the prepared cookie sheet. I used the smaller Pampered Chef scoop to scoop out my balls of dough. Using your palm, gently press down. Bake 10-12 minutes on a cookie sheet, slightly longer on the baking stones, until lightly browned around the edges. Let sit 1-2 minutes on cookie sheet to cool before removing to cool completely on wire racks. 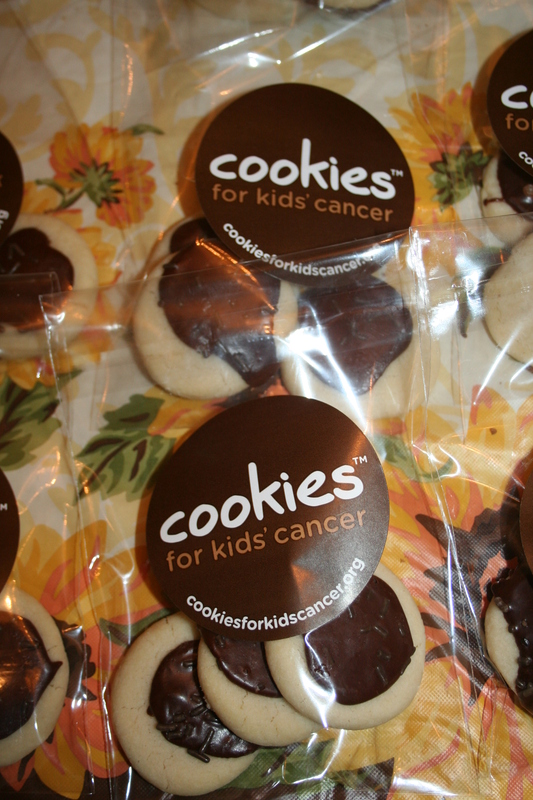 Consider hosting a Cookies for Kids’ Cancer bake sale for your organization’s next fundraiser. And what a great cause! Great cookie recipe. I am so amazed on how that little girl can baked cookies. I hope I could it too. Thanks for the great recipe.